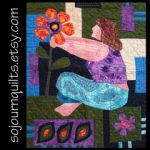 Contemporary Quilted Fabric Wall-Hangings, NotYerAverage Lobsters, Fabric Collage, ACEOs, Quilted Fabric Christmas Ornaments and more. Designed and handmade by me, Janyce, the fabric artist. Shop online 24/7 or in the local Bangor area by appointment. Free shipping and/or delivery to customers within the Greater Bangor area. Member of Maine Made. Sojourn Quilts - What A Discovery!! A family member alerted me to Sojourn Quilts some time ago and I began receiving Jan's newsletters. Intrigued, I asked her if I could sell some of her wonderfully whimsical lobsters at an RV craft fair. She agreed and sent several of the critters - one now sits on my pillow every time I make the bed! I sold a couple lobsters - and even the non-buyers were fascinated with the display. Jan had also included some of her wallets - all personally and creatively designed -and a couple of those grace a couple ladies' purses - or pockets as they are just right for carrying a credit card and driver's license to craft fairs - or on other shopping ventures. Jan is an artist with a special gift of imagination and I will continue to explore her many unique creations. I can totally vouch for Jan and her work. Tip-Top High Quality Originals from a talented LOCAL ARTISTE!